A site from China, Baidu said it had a photo of a new series phones from Nokia, the N9. Nokia explained that Nokia N9 will be the first handset using the base Maemo operating system. This operating system is the work of Maemo the last one used by N900. As news of TG Daily that is visible through the image, Nokia N9 Maemo use the candy bar with a sliding qwerty, still one version of what is used by the N900. However, no detailed explanation about the detailed specification of this Nokia N9 Maemo. From the design side, N9 it seems comes with a gray color that seem conventional. 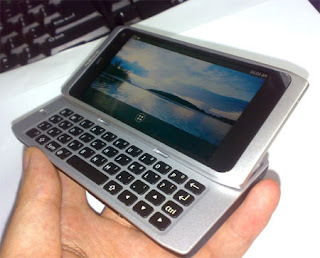 Even if at first glance, N9 very similar to the Nokia N97. Until recently, there has been no explanation from the parties regarding the circulation of the Nokia mobile phone photos Nokia N9 spread in China sites. But Nokia preparing to bring the handset with the base OS Linux, to compete with Android. In addition to spreading on the site, these photos have also been there in the forums that use China language. Despite still master of the mobile market, but from the side of the Nokia smart phones experiencing turbulence after the presence of Android and the iPhone. Although up to now which is identical to the Symbian OS Nokia, still dominate the market in the first position.